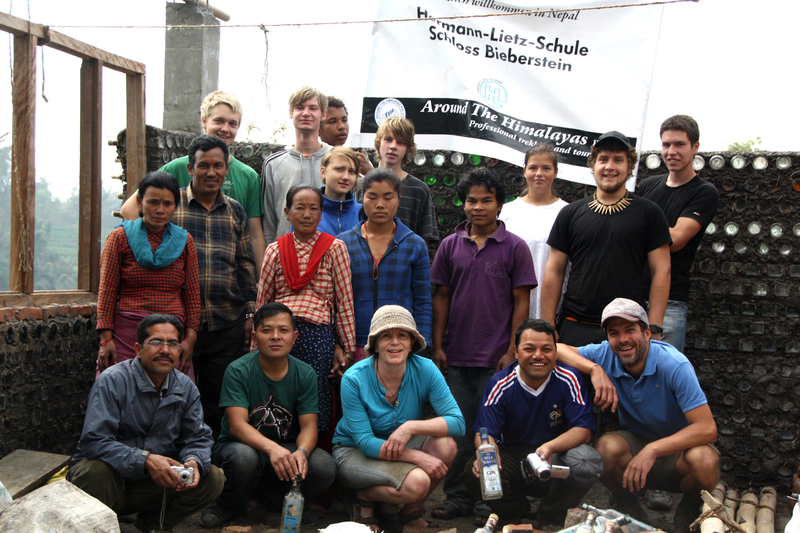 The cooperation between Hermann-Lietz-Schule Schloss Bieberstein in Fulda and the Nepalese Organisation PAORC was established in 2011. Every year 10-20 students and teachers travel to Nepal for four weeks to take part in the construction of new buildings. These “Bottle Houses” are mainly made from mud, straw and empty beer bottles which serve as insulating material. This environmentally friendly method contributes to solving the trash problem in Nepal by paying people to collect large amounts of bottles and putting them into good use. The Hermann-Lietz-School has developed a new educational concept in which students can participate on a voluntary basis. The goal is for the German students to work on practical and meaningful projects in order to experience making a positive and productive impact. Through friends we got in contact with PAORC, together we saw the opportunity to create a sustainable project where both sides profit. The German students experience living and working in a different culture, while the Nepalese kids can see a huge change in quality of life, especially when it comes to education. Our school’s efforts focus on a children’s home in the Manaslu area in Ghorka province. It is a quite remote mountainous area. Most of the essential buildings such as living quarters, kitchen, etc. are already finished, but it is not yet a great place for children to live and learn. Therefore, we are planning improvements such as a sports ground, a communal play and study area and a fruit and vegetable garden. In the next years, we will shift our efforts to other schools in the vicinity, which so far have not had the funds to rebuild the classrooms after the earthquake. We are also beginning to subsidize the education and salaries of selected local teachers.